He married his sweetheart, Kathy Jean (Conner) on January 5, 1995. Timmy was a truck driver by trade, but he really enjoyed camping, fishing, boating, hunting, swapping and trading and especially telling stories. He also loved cooking for his family, especially breakfast and smoking meats. Timmy enjoyed time with all the family and grandkids. 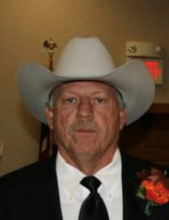 Cherishing his memory is his wife, Kathy Taylor; four sons, Roy Clovis and his wife, Melissa, Dale Leon Taylor, Matt Hayward and his wife, Rose and William Hayward all of Sayre, Oklahoma; two daughters, Kandi Burge of Elk City, Oklahoma, and Peggy Doneghue and her husband, Jason of Yukon, Oklahoma; seventeen grandchildren, Kierra and Kolt Taylor of Sayre, Oklahoma, Sade Taylor, Raylynn Cowser of McAlester, Oklahoma, Joseph Cowser of Elk City, Oklahoma, Sierra Taber of McAlester, Oklahoma, Trevor and Tierney Taylor of Mangum, Oklahoma, David DeGeorge of Lawton, Oklahoma, Keri DeGeorge of Oklahoma City, Oklahoma, Jake Hayward of Sayre, Oklahoma, Bradey Burge and fiance’, Rudi of Elk City, Oklahoma, Kristina Mossa and her wife, Alyssa of Oklahoma City, Oklahoma, Brock Doneghue of Michigan, Dakota Wright of Oklahoma City, Oklahoma, Shawn Hayward and his wife, Emily of Sayre, Oklahoma, and Kyle Duerfielt of Nebraska; seven great-grandchildren, Megan Kyles of Lawton, Oklahoma, Bentley, Krisstain and Taylor Hayward all of Sayre, Oklahoma, J.J. Blackburn of Lawton, Oklahoma, Elisabeth Blackburn of Marlow, Oklahoma, Angel and Miracle Blackburn of Oklahoma City, Oklahoma; four brothers; Bo and his wife, Becky of Eakly, Oklahoma, Buster and his wife, Dee of Sayre, Gary and his wife, Christine of Marlow, Peewee and his wife, Morene of Sayre, Oklahoma, four sisters; Lavon and her husband, Don Stevens of Weatherford, Oklahoma, Trisha and her husband, Dale Moler of Sayre, Oklahoma, Betty Sanders of Sayre, Oklahoma and Kathy Castro of Sayre, Oklahoma and numerous nieces and nephews. He is preceded in death by his parents, two grandchildren; Kati Rae Burge and Elizabeth Hayward, three brothers, Billy Jean Taylor, James Earl Taylor and Tommy Dean Taylor. To send flowers or a remembrance gift to the family of Tim D. Taylor, please visit our Tribute Store. "Email Address" would like to share the life celebration of Tim D. Taylor. Click on the "link" to go to share a favorite memory or leave a condolence message for the family.